DEL MAR, Calif. — Shots were fired while a horse race was underway and Ice Cube was preparing to perform at the Del Mar racetrack in Southern California Sunday night. San Diego County Sheriff's deputies said Daniel Elizarraras, 22, went to the ticket window at the Del Mar Fairgrounds at 2260 Jimmy Durante Blvd. at 6:40 p.m., asking for a ticket to the concert. Elizarraras was told there were no more tickets available, deputies said. An argument broke out and several nearby deputies responded. Investigators said Elizarraras pulled out a silver-plated semi-automatic handgun and fired several shots into the crowd. Deputies returned fire. Elizarraras was taken to Scripps Memorial Hospital La Jolla with gunshot wounds. In a statement, the Sheriff's Department said he was expected to survive. No one else was hurt, deputies said. 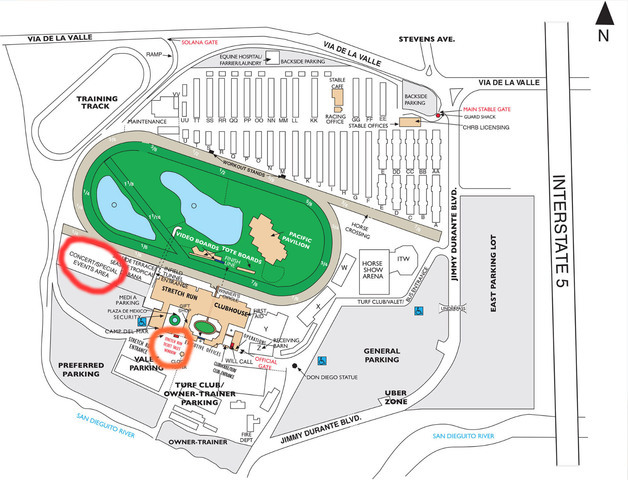 A map of the Fairgrounds indicates the shooting scene at the Stretch Run gate in orange. The red circle indicates where Ice Cube performed on the Seaside Stage. Multiple witnesses recorded social media video showing what appears to be a guard or deputy with a gun opening fire on a man in a black jacket. The Del Mar Fairgrounds specifically forbids weapons and simulated weapons on its premises. Witnesses gave KGTV conflicting reports about whether there was a bag check at the security gate. 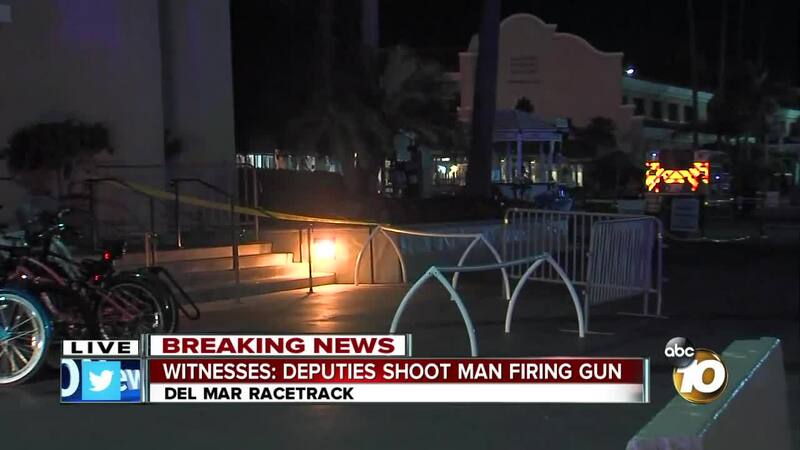 The Del Mar Thoroughbred Club issued a statement which read in part, "As is our special events protocol, substantial law enforcement and private security was on site in anticipation of the event. In light of the circumstances that unfolded involving one individual with a gun, we take consolation in the fact that no patrons, officers or security personnel were injured in the incident." Ice Cube and DJ Ratty were scheduled to perform after the last race as part of the racetrack's concert promotion. Just before 7:30 pm, the racetrack announced in a tweet that the shooting situation was contained and that the concert would move forward as planned. The concert started at 8:30 p.m. and was sold out. The races are in their final weekend of the summer season. The first Sunday post was at 2 p.m. with 10 races to be run, including the Del Mar Derby and Del Mar Juvenile Turf. DMTC officials said Monday's races would take place as scheduled. The situation has been contained. The concert is moving forward as planned.